Just in time for the winter Skoda released a new updated version of its Superb Estate, equipped with an advanced four-wheel-drive-system and with three choices for the engine. It features the fourth-generation Haldex clutch four-wheel drive which ensures maximum grip in snow or other slippery surfaces. It also makes towing trailers and caravans easier and increases the safety in tricky conditions. As for the engines, you can have it with either a 1.8 TSI 160bhp or a 3.6 liter V6 260bhp. These are the petrol units, you may also choose the efficient diesel engine which is a 2.0 TDI CR 170bhp. 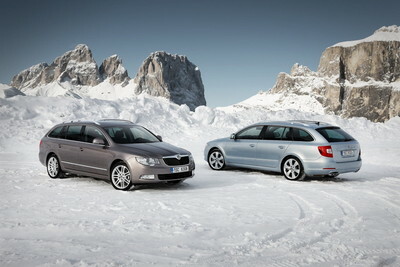 Prices for 2010 Skoda Superb Combi 4×4 starts at £22,420 for the 1.8 model.